Today Sony announced two new cameras, the A7 and the A7r. The A7 is a 24mp full camera with on-sensor phase detection focus support and an AA filter. The A7r is the same camera but with a 36mp full frame sensor that doesn't have on-sensor focus support nor an AA filter. Both cameras have a new body design that's a bit more traditional DSLR-like, with a (EVF) viewfinder hump centered above the lens. The EVF is the same 2.4m dot one that Olympus is now using in the VF-4 and E-M1. The bodies of both cameras are weather sealed, have tilting LCDs, 1/8000 top shutter speed with 1/250 flash sync, built-in WiFi with NFC, support PlayMemories Apps, and both take the usual NEX battery. Oh, and they weigh about one pound, which is significantly lighter than full frame DSLRs. While many of the rumors (and the name suggests) hinted that these full frame cameras would be essentially reworked NEX-7 models, there's a lot of reworking. If anything, the A7 and A7r function more like the RX1 than the NEX-7, including using the much more organized RX-type menus and controls (yes!). The sensors of the two cameras have some adjustment to the microlenses to compensate for the very short mount flange distance to sensor. The 36mp sensor is said to be a different iteration of the sensor used in the D800. 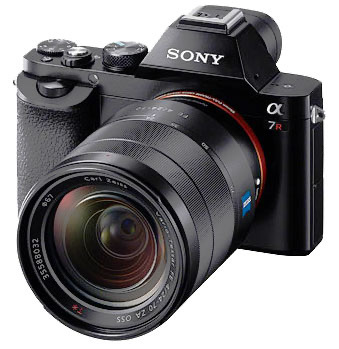 The A7 will be available for US$1700 body only or US$2000 with the 28-70mm kit lens (keep reading). The A7r will be available as body only for US$2300. These are aggressive prices for full frame cameras. Even if Sony has figured out some way to get yields up, the huge size of a full frame sensor makes the part itself very expensive, probably on the order of US$300-350 by itself. Still, Sony is obviously trying to use their vertical integration to try to undercut the far larger Canon 6D and Nikon D610 models. Whether that will actually happen is going to be up to the lenses, I think. You can use all current E-mount lenses on the cameras, but most of the existing ones should be used in APS crop mode of the new cameras, as they'll heavily vignette if used at full frame, often with clear infringement of the image circle. A Zeiss f/4 wide angle zoom and another fast prime are scheduled for 2014, and Sony says the total number of lenses available by the end of 2015 will be 15 (5 announced today, plus 10 more). So once again we start over with lenses. What's going to be available initially is mostly focal lengths in the mid-range zoom realm. I should also note that the kit zoom isn't exactly small, either, despite it's narrow focal range and slow apertures. Indeed, all of these lenses other than the 35mm are the size you'd expect of a full frame DSLR. More on the impact of that in a moment. The question here is what the overall Sony strategy is. Basically Sony has stepped into the same problem they did the first time around with NEX: interesting cameras with an initial lack of lens variety, and lenses that are large for the camera body size. To their credit, this time they're a little more forthcoming about their lens plan. Still, they're now starting to spread themselves thin in the lens development area: full frame Alpha mount, APS Alpha mount, full frame E-mount, and APS E-mount. Not to mention video lenses in the E-mount versus still lenses. It's a good thing they have Zeiss to help them. The risk here is that you start self-fulfilling a lack-of-lenses prophecy while also allowing people to imagine smaller lens lineups. To me, that latter part starts to sound a bit like "not fully interested in prosumer or pro users" because the two big established mounts Sony is trying to compete with have 70 or more current options from their makers, dozens more current options from third-parties, plus hundreds of past options that still work just fine. Pitching a "we'll eventually have a dozen lenses in this mount" scenario against the legacy players means that the potential buyer absolutely has to see the lens they need in the immediate near future, or else be restricted in what they can do with the camera. I'll remind everyone: the idea behind an interchangeable lens camera is that it isn't restricted in lens choice. Thus, limited lens options just becomes another friction that the camera has to fight against for sales. "What about mount adapters" you ask? Sony themselves seems to be promoting that in some places. First you start losing features. Basically you end up with manual focus lenses and perhaps even manual exposure lenses when you do this. (At least the two new cameras have focus peaking to help obtain focus.) But I'll point out that these are full frame, high resolution cameras. We've already seen small mount alignment issues turn into less than great results on such cameras just with the basic lens mount (e.g. some D800's can show side to side variation due to mount alignment on either the camera or lens). Adding another mount to the mix is asking for trouble. Indeed, I've pretty much stopped using adapters and teleconverters for that reason: the tolerances in the multiple mounts tend to be somewhat random and it's darned difficult to extract top performance without doing a lot of testing and trial and error swapping to find combos that "work right." Don't get me wrong, the new full frame E-mount cameras are very interesting, especially at their competitive price points. If you're not looking for a lot of lens choice early or the lenses you really want are in the lineup or will be shortly, I expect these cameras to be high on your list of possible choices. Still, here we are 14 years into the digital interchangeable lens camera game and we're still fighting lens choice due to proliferating mounts. That tells you a little bit about how well these companies planned their future. As in "not so much." And something tells me that we're not done with all the new mounts (or at least new variations on mounts). I'd also point out that people get caught up in strange economic interpretations. Sure, the A7 body price is US$1700. But if you need to buy another US$3000 worth of lenses, then it becomes a fairly costly system. Compare that to just buying a D610 or 6D and only having to add a new wide angle lens or two. That's where Sony is hoping the small size starts to pay off for them. That there's just enough extra in the mix that you'll potentially abandon sunk investment in a legacy lens system for something new, even though it might cost you some extra dollars in the long run. Note that Fujifilm did something interesting recently to get around the same problem: they offered substantive discounts on all their lenses if bought with a body, changing the economic calculations of a lot of legacy mount users. Okay, with lenses out of the way, let's talk about full frame. Disclosure: much of my current work is shot with a full frame D800 or D4. I put that disclosure there for a reason, as I'm going to go a bit down the "do as I say not as I do" line here. Full frame instead of APS is about a stop worth of difference, all else equal. Assuming we have the same sensor generation—and remember, Sony is the supplier for all these variations they're spinning out, so they are in control of sensor generations used—a 24mp full frame versus a 24mp APS are going to be about a stop apart in dynamic range, noise, and DOF at the same settings. Thus, the operative question here is whether or not you actually need or can take advantage of that extra stop. You're paying a premium for it (US$600 at the moment, NEX-7 versus A7, and the NEX-7 often comes with additional goodies and a 4% next order discount from many places). You may be paying a penalty for it, too: waiting for lenses you want to appear. I'd say that most people would be better off with the bird in the hand at a lower price than the bird in the bush at a higher price. At least short term. A number of commentators on the Web have been amplifying the "small performance" mantra that Sony wants you to. For example, while there's a one stop difference between APS and full frame, there's about a two-stop difference between m4/3 and full frame. A Panasonic GX7 is only two ounces lighter than the new A7 models, and the 17mm m4/3 lens and the new 35mm FE lens are the same weight. So the suggestion is that "you get more pixels produced with larger photosites in the same size package." Sure, until you compare the 35-100mm lens with the 70-200mm. What a lot of writers miss—and for that matter, camera makers—is that it is the size and weight of the entire kit you carry that makes someone choose some of the mirrorless options. Camera, lenses, accessories, tripod, and the bag you carry it all in are actually a bit different between an m4/3 system and a DSLR, and some of that difference is going to stay intact between m4/3 and NEX full frame, I think. As I've discovered over the years, sometimes even small differences in size/weight can make a tangible difference in some uses of a system. Consider the situation where I have to walk six or more miles to the entrance of a slot canyon, then make my way in areas that I can barely fit through. A big full frame DSLR system is out of the question for this unless I want to struggle. At my age, I don't want to struggle. At the moment I'm not seeing the A7r as my best choice in this situation, and it comes back to the size (and availability) of those lenses. 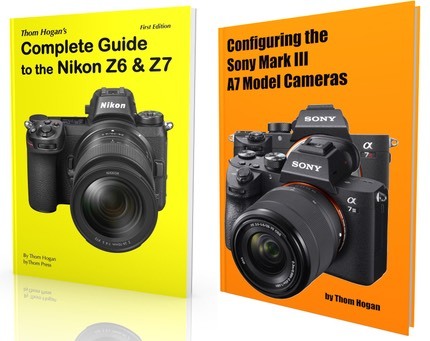 So comes the question: A7 or A7r? As an all-around camera, no doubt the A7. It's got a boost in the focus and continuous performance and a perfectly fine, well proven sensor (slightly updated RX1). You pay US$500 more to get the extra pixels and lack of AA, but I have to wonder whether the lenses where you'd really want those things are here yet. We really need a 24mm prime or a wide angle zoom before the A7r is going to make it as a "landscape" camera. As a "studio" camera, sure, maybe the lenses are there, but size of camera isn't all that important in the studio; I see no reason to abandon my D800E for that, and I've got far more lens choice, including the PC-E lenses, which are nice for studio work.